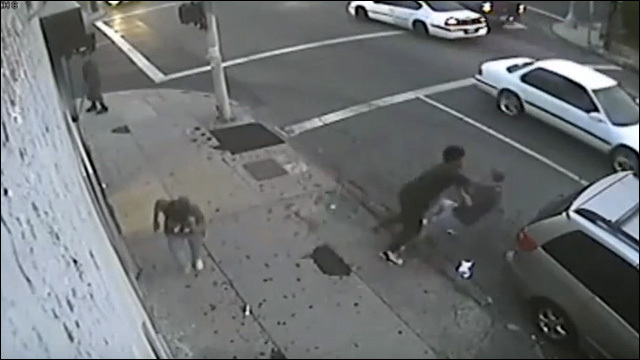 In Los Angeles, authorities are asking for the public's help identifying and apprehending a group of kid suspects who beat and stabbed a shop owner after he tried to stop them from stealing from his store last week. 56-year-old Young Ki Lee, owner of the 55th Street Market in South Los Angeles, said a group of kids tried to leave without paying for some items. He confronted them, followed them outside when one tried to run away, and attempted to pepper spray them. But the juveniles knocked Lee to the ground, smashed a bottle over his head, then kicked, stomped and stabbed him in the abdomen while he was passed out. The suspects finally ran away when a car pulled up to the scene. The victim's daughter, Beetna Lee, says her father is recovering and has returned to work at the store. She detailed the incident in a Facebook post and asked for the public's help identifying and finding the kids responsible for the attack. The attack occurred on September 21 at around 7:00pm on the 5400 block of South Hooper Avenue. Two of the suspects are described as male, black and between 15 and 19 years old. The third suspect is described as a female, Hispanic and approximately 18 years old. Anyone with information about the suspects is urged to call LAPD detectives at (323) 846-6562, or 1-877-527-3247 during weekends and non-business hours. Anyone wishing to remain anonymous should call Crime Stoppers at 1-800-222-8477. Tipsters may also contact Crime Stoppers by texting to phone number 274637 (C-R-I-M-E-S on most keypads) with a cell phone. All text messages should begin with the letters "LAPD." Tipsters may also go to LAPDOnline.org, click on "webtips" and follow the prompts.